See Removing the Battery Pack on page 56 2. See Removing the Middle Cover on page 61 3. See Removing the Keyboard on page 62 4. See Removing the LCD Module on page 62 5. See Removing the LCD Bezel on page 63 6. See Removing the Inverter Board on page 64 7. To remove the LCD, first remove the six screws from both sides of the LCD, then remove the LCD from the LCD panel. See Removing the Battery Pack on page 56 2. See Removing the Middle Cover on page 61 3. See Removing the Keyboard on page 62 4. See Removing the Keyboard Bracket on page 67 5. See Removing the DC Charger Plate on page 67 6. Disconnect the RTC cable and then remove the RTC battery from the upper case gently. See Removing the Battery Pack on page 56 2. See Removing the Middle Cover on page 61 3. See Removing the Keyboard on page 62 4. See Removing the LCD Module on page 62 5. See Removing the LCD Bezel on page 63 6. To remove the inverter board, first remove the screw from the inverter board. 7. 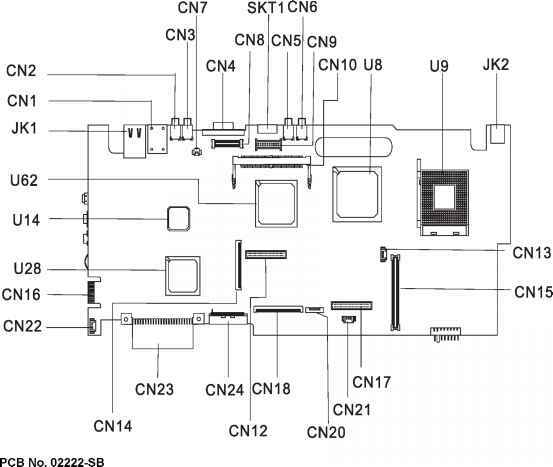 Disconnect the LCD power cable, remove the inverter board from the LCD panel, and then disconnect the inverter cable from the inverter board. See Removing the Battery Pack on page 56 2. See Removing the Middle Cover on page 61 3. See Removing the Keyboard on page 62 4. Remove the two screws from the base of the unit. 6. Remove the inverter cable from the main board with a plastic flat screwdriver. 7. Remove the four screws as shown and then detach the LCD module from the main unit carefully. 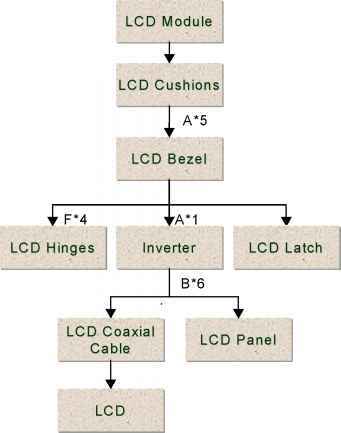 NOTE Please arrange the coaxial cable and the inverter cable well in the way as shown after you connect them to the main board. Please do the following to update BIOS in Windows environment. 2. Run WistronWFlash.exe. 3. In WFlash windows, choose LOAD BIOS BINARY FILE. Choose the new binary file you want to use for updates. 4. Choose SAVE ROM BIOS TO FILE as backup. 5. Choose PROGRAM BIOS. BIOS is updated. NOTE Should the procedure is not successfully completed, go to step 3, choose the ROM file saved in step 4. And, then, PROGRAM BIOS. The system will be recovered to the original BIOS version. See Removing the Battery Pack on page 56 2. See Removing the Middle Cover on page 61 3. To remove the keyboard, first remove the three screws as shown here. 4. Lift the keyboard upward carefully and put it on the upper case. 5. Use a plastic flat screwdriver to help disconnect the keyboard cable from the main board carefully, then remove the keyboard from the main board. See Removing the Battery Pack on page 56 2. See Removing the Middle Cover on page 61 3. See Removing the Keyboard on page 62 4. See Removing the LCD Module on page 62 5. Remove the four LCD cushions as shown and the middle lower mylar on the LCD bezel, and then remove the five screws below from the LCD bezel. 6. Snap off the bezel carefully, and then remove the LCD bezel from the LCD module.